Barb Wire Leather Cords 2.5mm round, regular color - mint green. 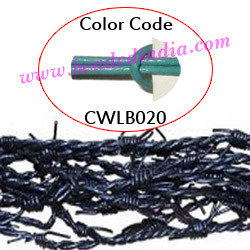 supper quality 2.5mm round barbed wire leather cords, regular color - mint green as per the photograph, pack of 25 meters. Barb Wire Leather Cords 1.0mm round, regular color - lilac. Barb Wire Leather Cords 2.5mm round, regular color - white. Resin Fancy Beads, Size : 16x22mm, weight 5.92 grams, pack of 100 Pcs. Flat Suede Leather Cords 4.0mm, Color - Light Turquoise. Silver Plated Headpin, size: 2 inch (51 mm), head size : 2mm, weight: 0.27 grams. Leather Cords 3.0mm (three mm) round, metallic color - purple. Leather Cords 5.0mm flat, metallic color - bronze.